having recently discovered the joys of ordering stuff from amazon, i finally got myself vegan cupcakes take over the world by isa chandra moskowitz and terry hope romero. such delightful things to try out! i never really follow recipes word-for-word, but this book has some great stuff in it. pistachio and rosewater cupcakes? mmm. i'll probably use these recipes as reference points for other kinds of cakes/brownie-style pies too, fiddling with cupcakes can be fun but also timeconsuming. 10 cupcakes in two and a half hours? a big tray of pie seems more fruitful somehow. the measurements are in americanish (cups) and i spent ages at realfoods, hovering about puzzled with the sales guy and trying to figure out what shortening was. in the end i just got some margarine, which is fine for frostings if you don't mind the yellowish tinge. 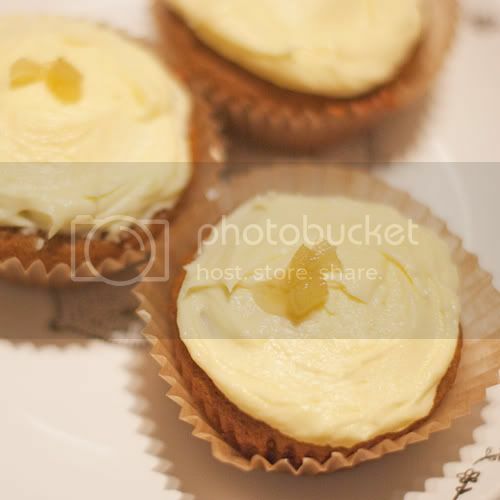 so the recipe i used today was gingerbread cupcakes with lemony frosting. there's some ginger bits in there too (i boiled the ginger first and rolled it around in sugar, and the leftover ginger water made a rather tasty drink, which i also added to the batter a bit). i ended up adding quite a bit more liquid than the recipe called for, maybe because i used dark sugar instead of molasses and less syrup. but the end result was still extremely tasty, well-risen fluffy cupcakes! and best of all, baby cows and baby chickens stay happy!